Ithaka S+R’s Research Support Services Program investigates how the research support needs of scholars vary by discipline. In 2017 and 2018 Ithaka S+R examined the changing research methods and practices of civil and environmental engineering scholars in the United States with the goal of identifying services to better support them. The goal of this report is to provide actionable findings for the organizations, institutions, and professionals who support the research processes of civil and environmental engineering scholars. The project was undertaken collaboratively with research teams at 11 academic libraries in the United States and Canada. We are delighted to have the American Society of Civil Engineers (ASCE) as project partner and sponsor. Angela Cochran, Associate Publisher at ASCE, served as a project advisor. The project also relied on scholars who are leaders in the field to engage in an advisory capacity. We thank Franz-Joseph Ulm (Massachusetts Institute of Technology), Antonio Nanni (University of Miami), Anand Puppala (University of Texas at Arlington), and Roger Ghanem (University of Southern California) for their thoughtful contributions. Many of the challenges civil and environmental engineering researchers face are shared with other STEM disciplines – a competitive funding landscape, a fraught peer review system, complex data management requirements. Yet this applied field presents unique opportunities for academic support service providers. Fundamentally focused on finding practicable solutions to real-world problems, civil and environmental engineering is highly collaborative, interdisciplinary, and close to relevant industries. Yet these synergies are largely built on old-fashioned research infrastructures. Inefficient systems for sharing data impede innovation, tools for discovering data and gray literature are inadequate, and career incentives discourage investment in the industry partnerships that shape the field’s future directions. Successful interventions will need to recognize and leverage the field’s strength in building personal, targeted, collaborative relationships, both within academia and between academia and industry. This report describes the distinctive ways in which civil and environmental engineering scholars conduct their research and draws out broad implications for academic libraries, universities, publishers, research technology developers, and others. Through its Research Support Services program, Ithaka S+R conducts in-depth qualitative analysis of the research practices and associated support needs of scholars by discipline in order to better understand changing research methods and practices. Our previous projects in the program studied scholars in history, chemistry, art history, religious studies, Asian studies, agriculture, and public health. A scholar-centered approach to understanding research in higher education is crucial to developing information services and spaces. By studying different disciplines, we gain a better understanding of how research activity functions across the academy. An investigation of research practices in civil and environmental engineering has the potential to illuminate the complex support needs of scholars whose work is both shaped by and ultimately intended to inform engineering practitioners. Academic civil engineering departments proliferated in the late nineteenth and early twentieth centuries, when professional engineers were required to keep pace with federal infrastructure spending; the addition of “environmental engineering” to department names beginning in the 1970s reflected the broader society’s changing needs and priorities. The discipline is now tackling new challenges, such as the influence of private technology companies like Google and Uber on transportation, the decay of public infrastructures, and the myriad ramifications of climate change. Innovative and effective research support services will help position the field to respond to these critical issues. Our report explores civil and environmental engineering scholars’ information activities over the entirety of their research lifecycle – from information discovery and access to organization, preservation, and dissemination – as well as their perceptions of the key issues facing the discipline and what those issues mean for the evolution of engineering research. We share our findings and recommendations in order to highlight opportunities for a variety of stakeholders to better support their scholarship. This project is part of Ithaka S+R’s ongoing program to conduct research on scholarly information practices by discipline through collaboration with higher education institutions. Participation in the project was open to any U.S. higher education institution with a civil and environmental engineering research program that was able to conform to the project specifications (e.g. timeline, research capacity). We invited all institutions that met these criteria. Appendix 1 lists the participants on the institutional research teams. We thank all the institutions that participated in the project. The partner libraries created research teams of one to four members who, following a training workshop designed and led by Danielle Cooper, collected the qualitative data that Ithaka S+R analyzed for this report. The research teams at the participating institutions primarily comprised subject librarians but also included participants in other roles, such as assessment librarians and graduate students. Each team conducted research with approximately fifteen civil and environmental engineering scholars at their institution through semi-structured interviews that followed the arc of the research process (see Appendix 2 for the interview guide). Each team developed its own analysis from the data it collected at its respective institution with the option of either creating an internal whitepaper or a publicly available local report. The publicly available local reports, which provide a complement to this capstone report, are listed and linked in Appendix 1. Ithaka S+R collected anonymized transcripts from the 109 interviews conducted across the participating institutions. We selected 40 of these transcripts as a representative sample based on the research subfields delineated below, academic title (assistant professor, associate professor, professor), and institution. The sampled transcripts were analyzed through a grounded approach to coding utilizing NVivo software. The interviewees remain unidentified in this report to protect anonymity. We thank the interviewees for their participation. This report focuses on the practices and needs of civil and environmental engineering scholars at higher education institutions. Reflecting the project’s aim to illuminate research as opposed to teaching activities, we define “scholars” as individuals who are employed by their institutions with research as a significant component of their job responsibilities, as opposed to those who primarily teach. Graduate students were not included in this study. The field of civil and environmental engineering is characterized by its disciplinary breadth and its orientation toward applied research, often designed and carried out in close cooperation with industry partners. Broadly speaking, the field aims to scientifically understand and improve the built and natural environments for the benefit of human society, with “civil engineering” researchers focusing on the built environment and “environmental engineering” researchers on the natural environment. This means that civil and environmental engineering is especially interested in domains such as public transportation and utility infrastructure, construction methods and project management, pollution and climate change, disaster preparedness, energy consumption, and sustainability design. Geographically, researchers may focus on applications in their local areas or tackle engineering challenges worldwide. Qualitative. Researchers investigate a community’s behaviors and preferences using tools such as surveys or questionnaires, interviews, workshops, and product trials. Formal methodologies include coding and qualitative comparative analysis. Fieldwork. Researchers observe processes and technologies in applied settings. They may do this either by installing and maintaining instruments that record, for instance, traffic flow or air quality. Or, they might make written, numeric, or photographic observations in person – for instance, photographing structural damage to a bridge, or counting the number of pedestrians who cross an intersection. They may also collect samples which are analyzed in the laboratory. Experimental. While fieldwork aims to gather data in “real world” settings, experimental research focuses on isolating processes and variables. It can occur in laboratories or in specialized testing facilities. The latter are often designed to allow experimentation in a particular domain, such as railroads, algae, or residential buildings, and might be maintained by industry groups or university departments. Modeling and Data Analysis. Researchers are increasingly using computerized mathematics to understand physical and chemical processes, networks, causal relationships, and probabilities associated with the built and natural environment. They also create software tools to help industry stakeholders make complex decisions. It is important to note that a single scholar or research group will frequently make use of more than one research methodology, such as by gathering experimental data to use in modeling, or by developing a new technology in the lab before “piloting” it in the field. The research of most civil and environmental engineering scholars involves working with others to a significant extent. Those “others” might include other academics, industry partners, librarians, and support staff. Working with other academics happens on several levels: within research groups; within faculties; across faculties within the same university; and with researchers at other universities. Broadly speaking, it can range from informally sharing insights – as when scholars meet to discuss common research interests – to undertaking more formal collaborative projects. Many interviewees implicitly defined “collaboration” as work resulting in a jointly-authored output, such as a grant proposal, report, or article. This report follows this distinction, considering “collaboration” to be a project-based cooperative venture and one of many ways of working with others. Civil and environmental engineering researchers also work extensively with what this report calls “industry partners,” namely government agencies, NGOs, and private companies. When interviewees were asked about how they work with industry partners, they described a variety of partner functions, including funding projects, defining research aims, supplying data, and contributing research insights. In academic-industry partnerships, these functions are often inseparable. This report also highlights the support infrastructure that enables civil and environmental engineering researchers to work with others. Technology has enhanced scholars’ ability to communicate and share information within collaborations, especially across distances, but it has not replaced the rapport and serendipity associated with in-person meetings. It is noteworthy that civil and environmental engineering scholars do not consider librarians to be collaborators in their research. However, they do turn to librarians for help with accessing published material, and are open to – though not yet widely accustomed to – working with librarians navigate the rapidly-evolving realms of data management and research dissemination. Civil and environmental engineering faculty members lead research groups comprised of graduate students and, in some cases, postdoctoral researchers and visiting scholars. Group members usually write literature reviews, conduct research, and draft publications under the supervision of the lead faculty member. Sometimes, one group member may be given responsibility for a specialized technical function within the group, such as information management. The applied nature of research in this field demands that insights and methods be drawn from several disciplines in order to achieve real-world impact. There are other practical reasons why civil and environmental engineering researchers work with others. Some study environments outside the United States and Canada and require the help of local experts; others need to access to specialized laboratory equipment housed at other universities. Competing for research funding can also necessitate assembling a collaborative team – “shotgun teaming,” as one interviewee put it. “If I know I’m writing a proposal on X, and it requires expertise in these three things, A, B, C, I search through my mental tree of people I know to find out who to contact,” another explained. Covering the needed areas of expertise is not the only consideration when selecting collaborators for proposals; when funding is being offered by a state government, an out-of-state researcher’s proposal may be more competitive if they find an in-state collaborator. Finally, many collaborations start from a desire to work with someone else’s data. Working with other academics to share data can be temporary and informal – providing data or contextual information over email – or long-term and formal – co-investigating on a project or jointly authoring an article. Temporary and informal data sharing exchanges will be discussed more fully in the section on “Sharing Data” below. The broad scope of applied research conducted in civil and environmental engineering departments means that the field collaborates with a wide variety of industry partners. These can be grouped into three categories: government agencies, non-governmental organizations (NGOs), and private companies. Government agencies. Civil and environmental engineering researchers collaborate with government agencies including municipalities; state health and transportation departments; and federal entities such as the Environmental Protection Agency, the Department of Energy, and the Department of Natural Resources. The National Science Foundation and its subsidiaries are particularly important partners in and funders of civil and environmental engineering research. Government-funded laboratories such as the National Institute of Standards and Technology and the National Renewable Energy Laboratory are also prominent in the field. Researchers at Canadian universities collaborate with a range of local and national Canadian government agencies. NGOs. Researchers who tackle global environmental issues will frequently partner with inter-governmental organizations such as the United Nations and World Health Organization, or with organizations working on the ground in developing regions. Some transportation and manufacturing trade associations, such as the Association of American Railroads and the Semiconductor Research Corporation, sponsor and facilitate research; these efforts are often funded by consortia of private companies. Finally, nonprofit research organizations such as the Transportation Research Board (TRB), a subsidiary of the National Academies of Sciences, Engineering, and Medicine, facilitate collaborative research; for instance, the TRB oversees the National Cooperative Highway Research Program, which itself aims to collaborate with state-level Departments of Transportation. Private companies. Civil and environmental engineering researchers partner with private companies such as consulting, architecture, and engineering firms; contractors; specialized manufacturers; and energy suppliers. Working with industry partners is fundamental to the research of many civil and environmental engineering scholars. On one level, industry partners represent the link which allows researchers to see their work applied in the built and natural environments. Just as importantly, industry partners shape the direction of civil and environmental engineering research and contribute to research processes, even as academic research opens up new strategic directions in engineering. As mentioned above, the function of some industry partners as funders of research is important, but in many cases the funding role is also inseparable from other collaborative contributions. Civil and environmental engineering researchers’ working relationships with industry partners can be conceptualized schematically (see Figure 1). Successful working relationships are mutually beneficial and tend to lead to further collaboration. Starting from the top of the diagram, industry partners identify engineering challenges or opportunities. They seek an academic researcher to investigate; if the industry partner is a government agency or NGO with sufficient resources, they may advertise a request for proposals and allocate research funding. Industry partners of many types will supply the researcher with proprietary data, and may be actively involved in shaping the research process. Once the research is completed, the scholar will communicate their findings to the industry partner for implementation. Such communication – which includes reports, practitioner-facing conference presentations, and the submission of engineering standards to practitioner committees for review – frequently results in a dialogue through which further potential research avenues are brought to light; the cycle restarts. Although every collaboration is different, this generalized schema can be used to understand a variety of types of industry partnerships. Larger government agencies and research organizations typically fund collaborative research projects, which may involve faculty members from different universities and/or industry consultants serving as co-investigators. Organizations working overseas will similarly shape research directions, but also play an important role in facilitating qualitative research and dialogue with local communities. State and local governments tend to contract researchers as consultants on specific environmental or infrastructure initiatives; or, a consulting firm working on such an initiative may subcontract a researcher. Several interviewees reported that they had been contracted by local governments or private energy companies to capture, store, and analyze infrastructure performance data. Others work with manufacturers to develop and test specialized equipment. All of these working relationships, if successful, involve the same core elements, in which industry partners both shape and support research, benefitting from research insights as a result. Although industry-academia partnerships can pose ethical concerns in some fields, interviewees overwhelmingly spoke of industry partners as positive actors in their research field. Many implied that helping a government agency, company, or organization improve their engineering products or processes was a desirable end in itself. Only a few interviewees alluded to potential ethical concerns. One asserted that “in the beginning” of an industry-funded project they establish that they will not allow the industry partner to manipulate research methods or outcomes to suit their own interests, and suggested that they had seen scholars at other institutions doing this. This scholar explained, “I tell [the partner], ‘Look … you’re going to tell me what we are studying; I’m going to decide what to do, how to conduct [it], how to collect the data, where to collect it.’” Another interviewee acknowledged inappropriate interference by industry partners as a potential problem in theory, but said they had never encountered such a conflict in their own research. By contrast, a number of interviewees said that they welcomed the involvement of industry partners throughout the research process. In both examples, the interviewees are motivated by solving a problem practitioners are experiencing. Industry partners are involved in both the research design and execution processes. Additional collaborators and third-party funders may be brought on board. Both interviewees emphasize that they “go back to” the industry partner with answers. This also allows scholars to “listen,” facilitating future cooperative work. As with academic collaborations, civil and environmental engineering researchers tend to discover and initiate industry partnerships on a personal, ad hoc basis. They are broadly familiar with the industry stakeholders operating in their research areas, and they build relationships with these stakeholders and keep abreast of industry trends and research needs by competing for funding, leveraging existing contacts, and attending conferences and offering workshops aimed at industry practitioners. The topic of research dissemination to industry partners is discussed at length in the “Dissemination” section below. Collaborative workflows are enabled using multi-purpose file sharing and document collaboration platforms such as Google Drive, Google Docs, Box, and Dropbox. Difficulties occasionally arise when collaborators use different citation management software, and there is some interest in having greater access to collaborative platforms that integrate seamlessly with citation management tools. Working with others can also compound the challenges of managing research data discussed in the next section. The importance of meeting in person extends even to working relationships within the same university. Yet some researchers find it easier to connect with colleagues from other institutions through conferences than with colleagues from different departments on their own campus. “So much of [working with others] still relies on running into your colleague in the hallway,” one interviewee explained, and researchers believe that the physical location of their departmental building has a real effect on how frequently they encounter colleagues from other departments. Departmental siloing may be particularly problematic for civil and environmental engineering, a highly interdisciplinary field in which jointly-affiliated researchers sometimes have their offices in other departments. In the absence of “a teleportation system around campus,” interviewees noted that research seminars are a good venue for facilitating inter-departmental, as well as inter-institutional, meetings. Civil and environmental engineering researchers tend to work with librarians on an as-needed basis, and this means that they require a comprehensive understanding of what services their libraries offer in order to take full advantage of them. This is because they view the librarian’s role as passive and reactionary rather than proactive. As one interviewee put it, “my general sense is if I ever have issues … the library is there to help, and it’s really more my deciding when I want help.” This is not necessarily a negative thing in researchers’ eyes: “When you go there and talk with them, you know that the goal is trying to help you.” However, a common refrain was that scholars are ill-informed about the range of ways in which libraries might support their research. Researchers’ tendency to work with librarians on an as-needed basis means that they require a comprehensive understanding of what services their libraries offer. Civil and environmental engineering researchers view the library’s primary function as providing them with access to published materials, both scholarly literature and, in some cases, gray literature. This function is detailed in the “Working with Information” section below. Interviewees also expressed an interest in obtaining librarians’ help with several other research support needs. Two of the most frequently emphasized areas appear to be research data management and navigating open access requirements and options. Although some researchers have a relatively limited vision of what support in these areas would look like – for instance, they may wish they could delegate the administrative function of organizing their research notes to someone else – others are interested in getting advice on best practices, either for themselves or for their graduate students. Research groups embarking on new, data-intensive projects would benefit from consultation with data management specialists, and bibliometrics experts could help advise pre-tenure researchers and graduate students on how to maximize the impact factors of their publications. Skills training is another area which researchers tend to associate with their libraries: in addition to academic writing workshops for their graduate students, they are also interested in gaining new technical skills themselves, especially in computer programming. “We weren’t in school when everyone was deciding [that] we needed to know how to do big data,” one interviewee explained. “And so a lot of us are trying to learn this stuff on our own.” Another described working with librarians to develop a user-friendly online platform for sharing their research data with the wider public. Finally, civil and environmental engineering researchers are interested in libraries offering in-house editorial services to help improve their journal articles and, even more importantly, their grant proposals prior to submission. Civil and environmental engineering researchers discover, access, and manage information throughout the research cycle. Scholars may obtain data from others – either other researchers or industry partners – and/or collect or produce their own data. The collection or production of research data requires scholars to coordinate and archive their research groups’ work using tools such as laboratory notebooks and shared drives. Data produced by other researchers, as well as industry data and gray literature, must be located either by leveraging professional networks or searching online. Once a researcher has obtained the data they need, they make decisions about how to organize, store, or dispose of it, taking into consideration factors such as funder requirements, file sizes, the potentially limited shelf file of file formats, and the high-turnover context of a research group, in addition to convenience and cost effectiveness. Finally, many researchers code software and create computer models for data analysis, and these research products must also be stored and managed. Civil and environmental engineering researchers also work with published scholarly literature – primarily journal articles in electronic form – and with gray literature. They employ a grab-bag of techniques to identify relevant information, gain access to it, and store electronic copies and citations for future use. As described in the introduction, the research of civil and environmental engineering scholars can be roughly divided into four methodological categories: qualitative, fieldwork, experimental, and modeling and data analysis. Reflecting this methodological diversity, the data produced and used in the field takes many forms, including numerical information produced through modeling or statistical analysis; results of laboratory experiments; sensor readings; photographs and written observations of field sites; documentation of construction management processes; and survey questionnaires and interviews. MATLAB, Excel, and R are all commonly-used software environments (R being both a software environment and a programming language) for data manipulation and numerical computing. In addition to these tools, researchers employ a host of specialized software programs to support tasks including statistical analysis, qualitative “coding,” modeling, graphing, Bayesian belief network analysis, traffic simulation, GIS work, and machine learning. They code using R, Python, and, less commonly, C++. In addition to the data they collect and produce themselves, many civil and environmental engineering researchers obtain research data from other scholars. They also rely heavily on data produced by governments, NGOs, and private organizations in the industry. This includes research data collected or posted online by government agencies and NGOs; data obtained through services such as Google Maps and Google Earth; and industry-specific documentation such as construction specifications and energy consumption records. The challenges of discovering and accessing data in civil and environmental engineering mirror those experienced by scholars in agriculture, another applied and multidisciplinary field. Datasets are often discovered incidentally while reading journal articles, attending conferences, or talking to colleagues or practitioners; scholars follow up on interesting leads by downloading supplemental files directly from a journal’s website, looking for the dataset in a repository, or getting in contact with the researcher who created it. When a scholar needs to search proactively for data, they often rely on their familiarity with the major repositories, databases, and industry organizations that pertain to their research area. One transportation researcher explained they often “just happen to know” who has the needed data, since “it’s a relatively small industry.” Some scholars even build programs that automatically identify and download new data from specific websites. Challenges arise, however, when a researcher begins to look for information in more disparate or less familiar domains. Challenges arise when a researcher begins to look for information in more disparate or less familiar domains. Accessing data can also prove challenging. Setting aside the task of convincing other researchers to share their data, which will be discussed in the next section, there are numerous potential barriers to accessing industry information. Some datasets must be purchased from local governments or private companies – an expense university libraries are often unable to shoulder. The collection and availability of government data can be subject to changing political priorities, and workarounds often involve leveraging professional networks. One interviewee reported that when climate change data was removed from the Environmental Protection Agency’s website, the data remained accessible only because some researchers, whom the interviewee knew “through Twitter and through other conference interactions,” had downloaded and publicized the data as a precautionary measure. Another researcher who sometimes needs to access air quality data collected by foreign governments noted that “that data is not available to us formally. But sometimes we have mechanisms get that.” Graduate students are sometimes responsible for the labor of collecting difficult-to-access data: an interviewee reported that one of their students has assembled data from hundreds of water utilities by submitting Freedom of Information Act requests. Ithaka S+R’s report on the research practices of public health scholars highlighted the difficulty of tracking down relevant gray literature; interviewees for this project echoed similar concerns. “Gray literature” refers to texts that are sufficiently technical and rigorous to be used in academic research, but which are not published by traditional academic presses. In civil and environmental engineering, this includes reports published by government agencies and NGOs, engineering codes and standards, and patents. Unpublished academic outputs such as conference posters and dissertations may also be considered gray literature. These texts are essential for allowing scholars to gather information about what is happening in applied engineering settings, but, like research data, gray literature is dispersed across the internet and nearly impossible to search systematically. One water researcher reported that because relevant gray literature is being released by a plethora of NGOs and governments, they find it “very challenging” to know “what’s out there without knowing in what organization it exists and going to their website.” Aside from domain expertise and incidental discovery, researchers rely on Google Scholar, which captures some gray literature, and, again, on their professional networks. Finding gray literature “is a lot of nitty-gritty one-on-one conversation work,” one interviewee explained. Civil and environmental engineering researchers face many of the same challenges with data organization and storage that Ithaka S+R’s reports have identified for other STEM-related fields. Few scholars are able to articulate comprehensive, systematic data management strategies for their research groups. Instead, data management practices tend to be habitual and reactive: as one interviewee put it, “when it gets past a certain point, we learn how to do something a little bit better.” Most research groups maintain a rough-and-ready system whereby students and postdocs keep data on their computers and periodically upload it to shared Box, Dropbox, or Google Drive folders. Group leaders make a particular effort to collect data from students before they graduate, but may struggle to navigate or understand that data later on. Quotidian data management responsibilities – maintaining file hygiene, updating metadata – often fall to graduate students, and many scholars would like their graduate students to receive data management training. In some cases, data which is governed by IRB (institutional review board) approval because it involves human subjects, or which is otherwise restricted by its provider, must be stored locally or only using approved software; such data may also need to be destroyed after research is complete. Setting aside those governed by specific data privacy or copyright requirements, very few interviewees spoke of a destruction schedule for data. Rather, the preference is for keeping information as long as possible – purchasing additional hard drives as necessary, despite the risk of file formats becoming outdated and unreadable over time. It is important to note that although funders are increasingly requiring grant recipients to articulate data management plans, there is a perceived gap between funders’ expectations and the availability of grant money to support data management efforts, for instance by paying the salary of a full-time expert. One interviewee admitted, “I do have concerns that I may not be quite living up to the expectations of the funding agencies as far as data management.” Comments like this suggest that merely writing data management plans into grant requirements may not have the desired effect. Significantly changing scholars’ data management practices will require research funding organizations and other stakeholders to take a more proactive approach. Civil and environmental engineering scholars use published academic literature to undergird and inform their own research projects, to stay abreast of new developments in the field, and to discover potentially relevant datasets, collaboration opportunities, and other academic literature. Published scholarly communications in this field primarily take the form of peer-reviewed journal articles, although researchers will occasionally also use textbooks, dissertations, and printed conference proceedings. Google and Google Scholar are the favored search platforms for literature discovery, with Web of Science and subject-specific bibliographic databases, such as Compendex and Engineering Village, also widely used. Like scholars in other disciplines, civil and environmental engineering researchers combine direct internet searches with a variety of ad hoc techniques for finding relevant published information, including setting up automated alerts for relevant content with publishers and search platforms; following references in literature they’ve already identified; and taking advantage of peer reviewing, editing, and graduate supervision commitments to stay abreast of new publications. Graduate students are often tasked with writing literature reviews or finding published information on particular topics, and interviewees expressed a desire for their students to receive additional training this area. A few groups employ systematic methodologies, such as Preferred Reporting Items for Systematic Reviews and Meta-Analyses (PRISMA), when conducting literature reviews, or keep shared spreadsheets in which group members identify and describe what they’ve read. Finally, researchers also identify potentially useful literature socially, by attending conferences, talking with colleagues and practitioners, and, in some cases, utilizing social networking sites, especially Twitter and ResearchGate. Civil and environmental engineering researchers strongly prefer to access academic literature online. They use preprints when they come across them in the course of searching for literature, but in general do not proactively seek them out. This is in contrast to other STEM-related fields, such as physics, mathematics, and computer science, which have strong preprint culture. When an item is not available online, a researcher will request it through interlibrary loan, ask a librarian for assistance, or, occasionally, email the article’s author directly to ask for a copy. Some institutions have document scanning services, through which faculty members can request materials only available in print to be scanned and emailed to them; these services may be under-utilized due to a lack of awareness among faculty members. Once a scholar has identified a relevant article, they usually download it in PDF format and may annotate it digitally. Although some researchers organize their personal collections of scholarly literature using citation management software such as Zotero, Mendeley, or EndNote, many prefer to maintain more or less systematic file systems on their own computers. Although some interviewees reported workflow inefficiencies in navigating their own literature collections, these do not appear to rise to the level of a major research challenge for most civil and environmental engineering scholars. This section discusses how researchers share data – how they use others’ data and make their own data available for others to use. Data can be produced by other academic researchers or by industry partners. Interviewees reported a range of attitudes in their research communities toward sharing data, and these attitudes vary within subfields, methodologies, and institutions. The majority of interviewees reported that they are at least somewhat engaged in sharing data with others. There are a number of reasons why civil and environmental engineering scholars use others’ data. Those whose research focuses on modeling require large quantities of experimental or field data with which to work, and they often rely on data produced by others. Experimental researchers may look for data that can be used to benchmark their own results or to assemble a larger sample for analysis, especially when the experimentation is expensive to perform. Still other researchers may seek a more rounded analysis by accessing data of a type that falls outside their own methodological specialty. Some types of data – such as seismic and weather recordings, public health records, and traffic data – are traditionally or proprietarily collected by government agencies, NGOs, or private companies. Finally, researchers sometimes conduct meta-analyses of the results of multiple field-based tests and observations. Researchers share data either personally or impersonally. Personal data sharing involves direct contact between the researcher who created or collected the data and the researcher who wishes to use the data, usually via email. Impersonal data sharing involves placing data in a publication, repository, or database and allowing it to be downloaded; the author does not control, and may not even be aware of, who is using their data or for what purpose. Sometimes, a researcher will need to use both personal and impersonal methods to get the data they need. They might download supplemental information from a journal article and then contact the article’s author with follow-up questions; or, they might contact a colleague to ask for data and receive a link to an online repository where the data is stored. Trust. The researcher must trust that others’ data is reasonably accurate; when data is shared personally, the data provider must trust that their data will be used in a worthwhile manner. Context. The user of the data must understand its context – what it measures and how it was gathered. The data provider must ensure that sufficient contextual information accompanies the data. Format. The data must be made available in a format suitable for transfer and reuse. Interviewees hinted at an unspoken rule that the more effort a researcher puts into sharing their data with others, the more recognition they will expect to receive in return. If they reference a figure from someone else’s published article, “then we just acknowledge in a paper, thank you for providing those data. But if we said, no, no, no, can you redo the analysis such that you get rid of this factor, so that [it’s] a little bit more consistent with my model, then you basically ask them to do more work. They will … let us co-author.” Convincing another researcher to share their data often involves demonstrating how it will benefit them through citations or, better yet, a more formal collaboration. “Since we’re usually trying to get other people’s data rather than the other way around, we have to first show them, usually with a little subset of the data, that we could do something very interesting with it, and they can be either lead authors or joint authors with us,” one researcher explained. Even though the data was published, the contextual information in the article wasn’t adequate to make the data useful. The interviewee knew the author’s article personally, but this alone didn’t supply the trust needed to initiate data sharing. The interviewee and the article’s author had different expectations around data sharing: the interviewee assumed that a citation was sufficient incentive to share data, while the article’s author assumed that data shouldn’t be shared until any resulting publications had been published. Many interviewees stressed the importance of shared datasets being accompanied by adequate contextual information, since “unless it’s been really well documented, how their test set up was constructed and what types of data they’re using, it can be really difficult to interpret the data correctly.” Some insisted that personal communication between researchers was the only way to adequately establish a dataset’s context. “For what I’m doing, the notion that anybody could upload data that would be self-explanatory without the PI [principal investigator] interaction would be very surprising,” one interviewee insisted. Another recounted an instance in which they almost made a significant mistake because a dataset had been incorrectly contextualized in a government repository. The error was only avoided when the researcher contacted the authors of the dataset directly. Even when a complete dataset has been appended to an article, researchers regularly find that the article does not provide enough contextual information to make the data usable. When this happens, they may email the article’s author directly to ask for more information. Difficulties with formatting, storage, and transmission can also impede data sharing. Some experimental researchers produce raw data in highly specialized or even proprietary formats which are difficult for other researcher to use. One interviewee expressed that they “thankfully” are not responsible within their collaboration for working with others’ data, because “it would take half the time just to learn what the data is,” even within the same subfield of air quality. The sometimes time-consuming task of format standardization can also discourage researchers from uploading their data to repositories. “I mean we’re happy to publish them,” one researcher who produces data in a specialized format explained, “but at the same time, I don’t want to frustrate people …. And then obviously another question is like okay, how much time do I want to spend on bringing the data to a level that is really directly useful?” The same interviewee indicated that they would prefer to wait until someone contacts them to ask for data before investing this time, rather than reformatting data which might sit in a repository unused. The need to process sensitive data to meet privacy standards before publicizing it throws up an additional barrier to sharing some datasets. One interviewee who works with utility data explained that they must often sign confidentiality agreements to head off concerns about potential lawsuits if their data is released to the public. Finally, it should be noted that a number of civil and environmental engineering researchers share their software models and other code on their group websites or, more frequently, through GitHub. These models are not data per se, but rather tools developed by researchers to manipulate and analyze data. Although one researcher complained of the need to field requests for “software maintenance” after having made a model publicly available, on the whole interviewees seemed less concerned about the practical difficulties of sharing their models through GitHub than about the challenges of sharing data online. One interviewee summarized the perspectives of many civil and environmental engineering researchers well: “In a way, it’s like it’s not like I don’t want to make [data on] that topic available, it’s the extra effort I have to put in to make them publicly available.” Many researchers remain unconvinced that the benefits of sharing data – or of sharing data more widely and efficiently – outweigh the practical difficulties. It is clear that there are significant inefficiencies in current data sharing practices within civil and environmental engineering. As one interviewee put it, “You just have to realize there’s sometimes where if somebody just got data and it’s just what you need, you’re just not going to get it.” Authors retire or lose track of old data files; internet links become outdated. There is a culture among some researchers that data is not shareable until any publications resulting from it have been accepted. “I see [data] as part of our intellectual property,” one interviewee stated. “I don’t necessarily want to share it with somebody outside unless I have to.” However, the same researcher’s group regularly extracts data from figures and tables in published articles. In fact, many scholars habitually extract numerical data from the processed figures and tables published in articles. Most use a software called ImageJ to do this; one interviewee reported having used a ruler to estimate values from a printed PDF of an article by hand. Unsurprisingly, these techniques yield only approximations of the underlying raw data. As one scholar put it, “you never get it exactly correct, it’s kind of, ‘It’s close, close-ish.’” Re-using data becomes like a game of telephone. It is clear that there are significant inefficiencies in current data sharing practices. Scholars see “big data” as something they hope to tackle in the future rather than as a present research concern. Although some civil and environmental engineering researchers are trying to collect large quantities of others’ data for use in modeling, meta analyses, and synthesis papers, difficulties with sharing data have meant that the field as a whole has not fully embraced data-intensive research methodologies. “I would measure the success [of data repositories] by how many people are actually using the data to do something new,” one interviewee said. “I don’t know if I hear about that a lot …. I certainly don’t hear about it as much as I hear about the new projects, the new tests, the new big things coming out.” Many scholars in the field see “big data” and associated tools, such as artificial intelligence, as something they hope to tackle in the future rather than as a present research concern. It therefore appears that there is potential for enhanced data sharing practices to transform methodologies and research directions in civil and environmental engineering. Civil and environmental engineering scholars disseminate their research findings to three main groups: other academic researchers, industry partners, and the general public. Academic communications are, unsurprisingly, prioritized, with traditional peer-reviewed journal publications universally the medium of choice. Some researchers also supplement or promote their publications using academy-facing websites, blogs, and social media accounts. However, the applied nature of the field – and the reciprocal benefits of academia-industry partnerships, as discussed in the “Working with Others” section above – mean that many scholars are substantially engaged in communicating their research findings to engineering practitioners through specialist publications, courses, workshops, webinars, and professional conferences. By contrast, civil and environmental engineering scholars are relatively disinterested in communicating their research findings to the general public. “We kind of serve two masters,” one interviewee explained. “Obviously [there are] all the things one would do academically, but we also need to provide value to the [industry] partners.” Although public engagement is not unknown in the field, many civil and environmental engineering researchers prefer to concentrate their dissemination efforts on the “two masters” of academia and industry. Like academics in other STEM subjects, civil and environmental engineering researchers primarily disseminate their research to other scholars through peer-reviewed journal articles. They select which journal to publish in based on relevance, prestige, and, to a lesser extent, the perceived speed and quality of the journal’s review process. Other academic publications – textbooks, conference proceedings – are viewed as less selective and therefore less desirable for tenure and promotion purposes. However, some subfields on the “civil” side of the field have journals, such as the Transportation Research Record, which selectively publish conference proceedings and which carry prestige in their respective research communities. Across subfields, conference presentations themselves, though important, are thought of as mechanisms for discovering and sharing new developments in the field, rather than as valuable research outputs. In general, tenured researchers feel more freedom to publish in ways that best reach target academic audience regardless of impact factor, whereas junior faculty members decide where to publish based on impact factor and the perceived opinions of senior colleagues. “I’m reaching the audience that will read it, and I’m also sending a signal to people that decide on my career,” one interviewee explained. The peer review system is viewed simultaneously as indispensable and as broken. Communicating research findings to practitioners plays an important role in building mutually beneficial industry-academia relationships. Scholars also communicate their research findings to practitioners in person, through short courses and workshops, professional conferences, or virtually through webinars. Professional conferences provide opportunities for researchers to not only communicate their findings to practitioners, but to network and generate new ideas. Courses and webinars can be hosted by professional bodies such as the American Society of Civil Engineers, or by local government agencies. One interviewee said they are about to embark on a ten-state tour, “trying to improve basically the state of practice” by holding training workshops for engineers at state Departments of Transportation. It should be noted that not all civil and environmental engineering researchers are enthusiastic about industry communications. Academic reward structures dissuade some from devoting work hours to forms of dissemination other than peer-reviewed articles unless absolutely necessary. “I don’t really like them,” one interviewee said of trade journal articles, because “they take a lot of time.” This researcher does, however, publish in trade journals when required to do so under the terms of an industry-sponsored project. Another interviewee expressed concern that publicly available technical reports “steals your thunder if you’re going to write a journal article” arising from the same project. The prioritization of industry communications in the face of significant academic disincentives underscores the field’s close relationship with adjacent industries. Most researchers, however, try to strike a balance between publishing peer-reviewed articles and engaging practitioners. One interviewee explained, “To me a good project is one where we get a refereed journal article, a refereed conference publication, and something practical, a specification or … something a practitioner can use.” Although those who make an effort to communicate their research findings with industry reap the benefits of stronger collaborative partnerships, they must contend with institutional cultures and tenure committees which place a low value on this type of dissemination. “This doesn’t give you much impact factor,” one interviewee admitted. “Gets me in trouble with the head of department.” The prioritization of industry communications in the face of significant academic disincentives underscores the field’s close relationship with adjacent industries. This is not to say that all civil and environmental engineering researchers are disinterested in publicly disseminating their work. One interviewee voiced enthusiasm about “science communication,” reporting that they regularly post videos on YouTube that “translate the science to a broader audience”; they noted, however, that this level of social media engagement is “atypical” in the field. Another reported giving well-attended public lectures in the aftermaths of major earthquakes, and even speaking at local schools. Several interviewees said their work has been featured by regional or national news sources; others typically put out press releases and videos when their work is published in Nature or Science, or write general readership pieces for those journals. One interviewee who works in the transportation subfield described an aspiration of engaging the public in order to change social norms around automobile and pedestrian safety, starting with their own campus and extending outward. This scholar did not indicate that they were actively involved in starting such a campaign, but their comments demonstrate how some researchers might envision their work having a significant impact on the general public – even if their own capacity to enact this vision may be limited. The most common form of open access publishing – by paying article processing charges (APCs) to “hybrid” journals – is usually selected by researchers only if their funder requires it and allows APCs to be written into the project’s budget. (As one interviewee noted and as research has shown, enforcement of funder open access requirements is inconsistent at best.) A few scholars reported having taken advantage of institutional funding for APCs, often administered through their institutional libraries. In comparison with these challenges, the principal barriers to the widespread adoption of preprint dissemination in civil and environmental engineering appear tractable. Many interviewees expressed amenability to uploading preprints to their institutional repositories, but did not know that the opportunity existed, did not know how, or had not found the time to do so. This is in spite of the fact that interviewees reported reading others’ preprints when available. Confusion around copyright is another significant deterrent. “Maybe a lot of it comes from disinformation,” one interviewee said, “but I’m just shying away from it.” Another interviewee decided not to make a preprint available because their colleague predicted that other researchers would continue to cite the preprint version even after the article was published. Still another gave up after having several engineering articles rejected by the repository arXiv, which focuses on physics, mathematics, and computer science – apparently unaware of other suitable options. It should be noted that the experience of Canadian researchers in this area differs from that of their American counterparts; Canada’s three major government funding agencies recently began requiring that resulting research be made openly available at least in preprint form within twelve months of publication. For a few researchers – particularly on the “environmental” side of the field – ethical considerations weigh into decisions about access. Those who work on infrastructure and sanitation projects in the Global South are conscious of the need to make their research accessible to practitioners overseas who cannot afford to pay for access. Explained one interviewee, “That I would go to [another country] and do a bunch of measurements and then someone [there] would have to pay 50 bucks to see a paper that was paid for by, say, an international NGO or the government – it doesn’t sit well with me.” A similar logic underlies the ethical concerns of some scholars whose research touches hot-button, domestic public health issues. Referring to the lead contamination crisis in Flint, Michigan, one interviewee said, “There’s increased pressure – not even just pressure, but desire for us to become more engaged in society, with the public. And so communicating findings and making them accessible and available to the public is going to become increasingly important.” The equation becomes more complex for climate change researchers, who must sometimes weigh a desire to influence public discourse and government policy against the fear that their research may be targeted or co-opted for anti-scientific ends. The interviewee is required by European funding agencies to publish open access articles, but avoids including complete datasets in these articles. Two competing priorities are at work: gaining the public’s trust through transparency, and controlling the public discussion around the science of climate change. This report examined the research practices of civil and environmental engineering scholars in working with others, working with information, sharing data, and communicating research. When these areas of practice – and current research support infrastructures – are evaluated as a whole, two key themes arise which inform our recommendations. Industry – by which this report means all the government agencies, NGOs, and private companies who carry out relevant engineering projects – is not just a recipient of academic civil and environmental engineering research. Rather, industry is a research partner. Far from simply providing project funding, industry organizations and individuals provide crucial data, contribute expertise, and shape future research directions. This report describes how industry-academia partnerships are often mutually beneficial and self-perpetuating. Industry partners gain research-based solutions to technical problems and innovation needs, while scholars gain funding, access to data, and the opportunity to see their work effect real improvements in the built and natural environments. Although many of these industry-academia partnerships are thriving, our findings suggest that scholars face significant challenges in communicating their research to industry. Some civil and environmental engineering scholars are publishing in trade magazines, writing standards and reports, attending professional conferences, and delivering workshops, despite the fact that institutional tenure and performance evaluations place little value on these activities. Others – especially pre-tenure researchers – feel that only academic outputs are worth investing precious time. Our recommendations urge universities and others to systematically incentivize innovative and effective industry communications in order to strengthen essential academia-industry partnerships. Open access is unlikely to be a panacea for research impact. Another implication of the close relationship between civil and environmental engineering researchers and industry is that open access is unlikely to be a panacea for research impact. Although scholars in the field are concerned about shaping public narratives around infrastructure, the environment, and climate change, their primary “public” is engineers and engineering organizations. Our findings indicate that one major impediment to data-driven innovation may lie in the limitations of current systems and practices for sharing research data. Well-enforced funder, journal, and institutional requirements can help, but successful data sharing also requires trust between researchers, adequate contextual information, and useable file formats. The current landscape of overlapping generalist, subject-specific, institutional, and journal data repositories is overwhelming to many scholars, and data publications and other data sharing activities are little valued in tenure portfolios. Outside of data repositories, the diffuse nature of industry data, the lack of comprehensive discovery tools, and the privatization of important datasets present further challenges. When data sharing works, it is often because scholars are leveraging their professional networks to discover and obtain what they need, and we recommend that any interventions build off of the field’s existing capacity in this area. It remains unclear who is best positioned to enact systematic improvements in data sharing. It remains unclear who is best positioned to enact systematic improvements, but our findings suggest important considerations for the main contenders. Research into open access requirements suggests that funders’ policies can shape disciplinary cultures, and arguably the most successful data repository in the field is the NSF-funded DesignSafe. Journals, on the other hand, have the advantage of already being one of the most important ways in which researchers discover relevant datasets – at least until search engines like Google Datasets improve to the point of widespread adoption. Universities, which have the potential advantage of being able to integrate institutional repositories with their own data management services, have not yet grappled with the possibility that they might incentivize data sharing by tying it to faculty members’ performance evaluations. Industry partnerships and data sharing are not the only areas in which research support services for civil and environmental engineers can be improved. In fact, many of the challenges interviewees identified resonate with the experiences of scholars in other applied, interdisciplinary, and STEM fields. Our findings suggest potential interventions to help scholars collaborate more effectively and more often; to increase uptake of library services and information technologies; to improve lab group workflows and data management; and to train graduate students in essential research skills. The recommendations that follow point to the dynamic work necessary to support Civil and Environmental Engineering scholars’ research in the years to come. Support industry-focused research impact. Many interviewees feel their work will have the greatest impact if communicated to relatively narrow target audiences within adjacent industries. Librarians should help scholars identify and use methods for measure the impact of research communicated to engineering practitioners. Facilitate inter-departmental encounters. Civil and environmental engineering researchers work extensively with scholars in other fields, but sometimes feel isolated within their own institutions. Research seminars and dedicated interdisciplinary workspaces can encourage serendipitous knowledge exchanges. Provide tools to smooth negotiations with collaborators. Civil and environmental engineering scholars collaborate extensively, but interviewees indicated that they face challenges in navigating issues around authorship and intellectual property with collaborators. Develop protocols and templates to help them address these sensitive issues effectively. Train graduate students to navigate the scholarly communications landscape. Much of the burden of literature discovery and review falls on graduate students. They need thorough training, not just in utilizing the services which their university library offers, but in navigating the broader ecosystem of scholarly communication, from Google Scholar to preprint repositories to Twitter, in order to identify relevant research. Simplify collaboration. The research of civil and environmental engineering scholars is increasingly conducted in collaboration with other researchers. But working with others introduces frictions around information management, communication, and expectations. Increase collaborative productivity by providing subscriptions to file sharing platforms, preferably with integration capabilities with citation management tools. Support data management best practices. Civil and environmental engineering scholars are aware of the gap between ideal and reality when it comes to their own data management regimes. It is not enough to simply offer software subscriptions and consultations. Universities must incentivize good data management – for instance, by integrating tenure review processes with institutional data repositories. They must also invest in technologies, such as Montana State’s intent-based network, that allow campus IT professionals to customize data storage solutions to engineers’ idiosyncratic needs. This is also an area in which training and habits have not kept pace with technological affordances. Within research groups, graduate students already shoulder much of the responsibility for data management day-to-day. Graduate programs should provide early training in version control, metadata creation, and data security. Reward impactful research communication. Civil and environmental engineering scholars already engage with practitioners in spite of institutional pressure to publish exclusively in academic journals. Dissemination to industry is an essential part of mutually beneficial, research-shaping collaborations. Revise tenure and promotion criteria to recognize effective and innovative engagement outside the academy. Fairly evaluate data papers. So-called “data papers” have not gained significant traction within civil and environmental engineering, at least in part because scholars doubt they will be worth taking time away from writing traditional articles. In concert with faculty members, develop tenure and promotion criteria that give researchers appropriate credit for making valuable datasets more widely available. Improve training in academic writing for graduate students. Civil and environmental engineering researchers acknowledge that there is a formula to good academic writing – but they are often unwilling or unable to teach it to their graduate students, many of whom speak English as a second language. Graduate programs should incorporate teaching and assessment of academic writing skills, preferably early on. There may be potential for fruitful collaborations between liaison librarians and writing centers to provide engineering-specific writing instruction. Help scholars find gray literature. Many civil and environmental engineering scholars struggle to locate the data and gray literature they need, or even to know what information exists. Develop and improve search engines to retrieve data and gray literature from the webpages of industry, government, and NGO websites as well as from academic repositories. These efforts will require coordination with organizations that publish data in order to optimize formatting for discoverability. Create lab-proof and field-proof notetaking hardware. Scholars are already using cloud technologies to facilitate collaboration within their research groups, but many still rely on handwritten laboratory and field notes because they are reluctant to expose computing equipment to hazardous conditions. Before this field can weigh the merits of different electronic laboratory notebook (ELN) software packages, technology developers must first create durable hardware for use with ELNs. Make academic collaborators discoverable. Civil and environmental engineering researchers often find themselves searching for potential academic collaborators with a specific expertise or geographic presence. However, they have not widely adopted online networking tools like ResearchGate for this purpose, likely because of insufficient coverage. A simple, up-to-date directory of civil and environmental engineering research interests across universities and departments – similar to state-wide research directories in New Jersey and Ohio – would facilitate new collaborations. Develop new channels and formats to reach professional audiences. Trade publications and workshops are already successfully used for translating engineering research for practitioners, but there is room for innovation. Develop better ways to get research insights into practitioners’ hands, whether through searchable online digests, videos, or smartphone apps. Similar ventures in the medical field suggest ways forward. Provide leadership in public communication. In addition to reaching practitioners, scholars are increasingly interested in engaging the general public on issues such as climate change and infrastructure. But many are ill-equipped to translate their work into strategic, compelling messages or worried about dealing singlehandedly with hostile reactions. 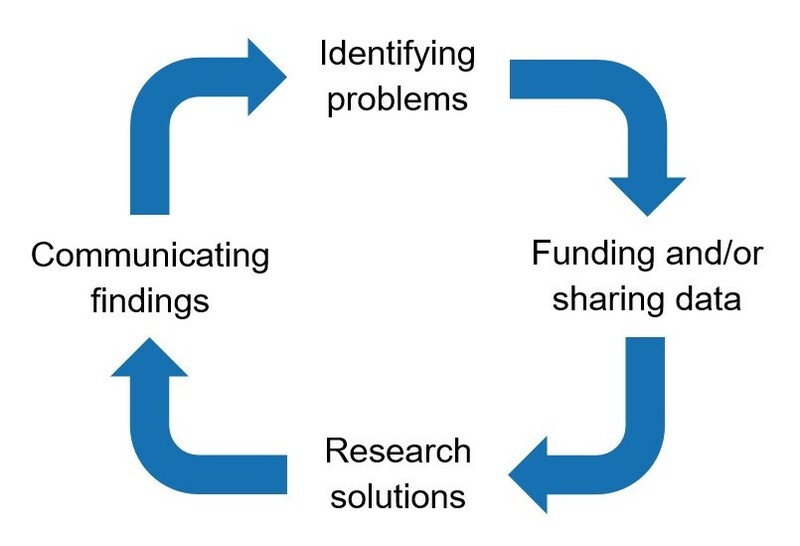 Societies are ideally placed lead public engagement initiatives at scale, such as by providing researchers with communications advice, hosting outreach events, and publicizing relevant research. Fund good data management – and enforce it. Simply forcing scholars to write data management plans into grant requirements isn’t sufficient. Civil and environmental engineering researchers need user-friendly, funder-approved data repositories, and they need funders to greenlight the dedication of grant dollars for data management. Given this provision, researchers’ data management practices would also be improved through periodic check-ins and enforcement to ensure best practices not just before a project begins, but during research and after completion. Support data gathering and dissemination projects. Some scholars are already working to make difficult-to-access data – whether because it is politically volatile or simply disparate – easily accessible to their peers and the public. Funders should seek to back projects that serve the civil and environmental engineering research community in this way. Adjust grant requirements to reflect the importance of industry. Major funding organizations are increasingly stipulating that grant recipients must make their publications freely accessible, but it is often more important – and more socially impactful – for civil and environmental engineering scholars to disseminate their findings to practicing engineers. Requirements for grant recipients should acknowledge this. For instance, engineering scholars might be allowed to fulfill a funder’s requirements by publishing in a trade magazine rather than publishing in an open access journal. Describe your current research focus and projects. How is your research situated within the field of civil and/or environmental engineering? Does your work engage with any other fields or disciplines? What research methods do you typically use to conduct your research? How do your methods relate to work done by others in civil and/or environmental engineering (and, if relevant, in the other fields with which you engage)? Do you regularly work with, consult, or collaborate with any others as part of your research process? If so, whom have you worked with and how? Are there any resources, services or other supports that would help you more effectively develop and maintain these relationships? How do you analyze the data [e.g. using a pre-existing software package, designing own software, create models]? How do you manage and store data for your current use? Do you use any other tools to record your research data [e.g. electronic lab notebooks]? If so, describe. What are your plans for managing the data and associated information beyond your current use [e.g. protocols for sharing, destruction schedule, plans for depositing in a closed or open repository]? Have you encountered any challenges in the process of working with the data your research produces? If so, describe. Are there any resources, services or other supports that would help you more effectively work with the data your research produces? What kinds of data produced by others do you typically work with? How do you find that data? How do you incorporate the data into your final research outputs [e.g. included in the appendices, visually expressed as a table or figure]? How do you manage and store this data for your current use? What are your plans for managing the data beyond your current use? Have you encountered any challenges working with this kind of information? Are there any resources, services or other supports that would help you more effectively work with the data produced by others? What kinds of published information do you rely on to do your research [e.g. pre-prints, peer-reviewed articles, textbooks]? How do you manage and store this information for your ongoing use? What are your plans for managing this information in the long term? Have you experienced any challenges working with this kind of information? Are there any resources, services, or other supports that would help you more effectively work with this kind of information? Where do you typically publish your scholarly research? What are your key considerations in determining where to publish? Have you ever made your scholarly publications available through open access [e.g. pre-print archive; institutional repository, open access journal or journal option]? If yes, describe which venues. Describe your considerations when determining whether or not to do so. Do you use social networking or other digital media platforms to communicate about your work [e.g. ResearchGate, Twitter, YouTube]? If yes, describe which venues and your experiences using them. If no, explain your level of familiarity and reasons for not choosing to engage with these kinds of platforms. How do your publishing practices relate to those typical in your discipline? Have you encountered any challenges in the process of publishing your work? Are there any resources, services or other supports that would help you in the process of publishing? How do you connect with your colleagues and/or keep up with trends in your field more broadly [e.g. conferences, social networking]? What future challenges and opportunities do you see for the broader field? Is there anything else about your experiences or needs as a scholar that you think it is important for me to know that was not covered in the previous questions? Cooper, Danielle, Rebecca Springer, Jessica G. Benner, David Bloom, Erin Carrillo, Alexander Carroll, Bertha Chang, et al. "Supporting the Changing Research Practices of Civil and Environmental Engineering Scholars." Ithaka S+R . Last Modified 16 January 2019. https://doi.org/10.18665/sr.310885.